Ale brewed with honey & orange peel. 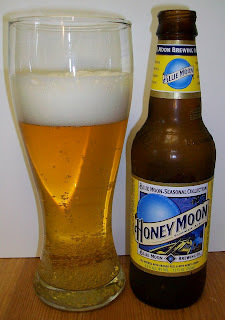 Welcome the season with Honey Moon Summer Ale, the winner of the gold medal in the Specialty Honey Lager or Ale category at the Great American Beer Festival 2006. This ale is brewed with clover honey, orange peel, pale malt and malted white wheat. Compliment any summer gathering with this crisp, refreshing ale. I am continuing my beer cabinet spring cleaning (drinking), which has brought me to beers that are gifts or suggested by friends to review. But before we start on this review I have to say a few words about Blue Moon in general. 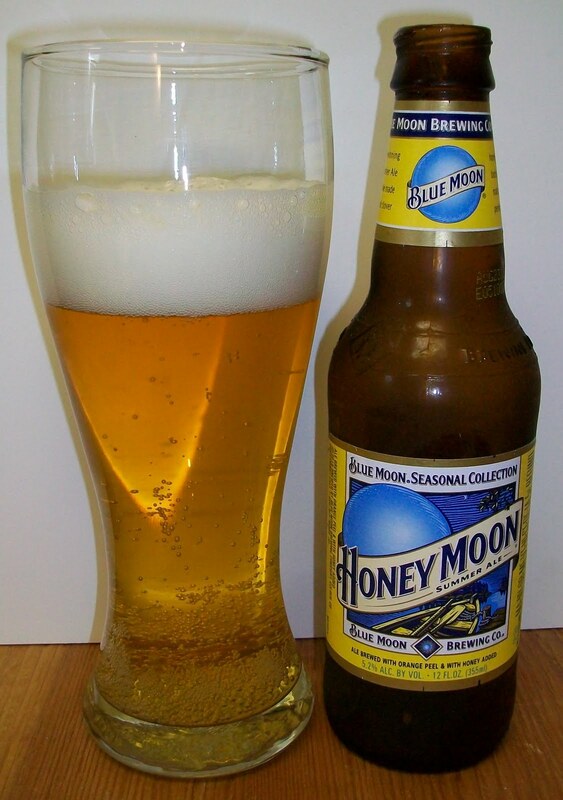 Blue Moon is a Belgian inspired wheat beer or Wit from Coors Brewing Co. essentially a Hoegaarden knockoff. Since its great success they have come up with a whole Seasonal Collection series of wheat beers. And they are all too some degree successful. Blue Moon is so successful in fact that I have noticed a pattern with its drinkers. They seem to be “Beer Snobs” in the making. This beer has given a tremendous amount of people a taste of craft beer, and they like it. Not that Blue Moon is that exceptional but it is widely available and affordable. It’s a nice drinkable beer that seems to awaken the palate and has its drinkers looking for other good beers. It truly seems to be the first step into the World of Craft Beer. Review:The beer pours a crystal clear pale straw color with a bright white head. It is also highly effervescent with lots of tiny bubbles rising up from the bottom of the glass. Wow, this nose is surprising. Sweet light malts with some citrus notes and a nice flowing hop aroma. There is not much to the taste but this is a very clean and refreshing beer. There won’t be much of a play by play but I’ll try to give you some more detail on the experience. Sweet light wheat malts up front on the tip of the tongue, this may be honey also, then a very clean and refreshing effervescence over the tongue at mid-sip. There is not much on the back-end; it is just a very easy to swallow, easy drinking beer. The finish is very clean, almost crisp with a very nice and refreshing aftertaste of light wheat and citrus notes. All and all I am pleasantly surprised by this beer. This is a very refreshing summer ale. It is also warming well. It is now at 66 degrees and there is nothing whatsoever unpleasant about this beer. At this warmer temperature I can pick up more of the citrus in the finish and aftertaste and it is actually quite nice. This is one beer that I may end up buying this summer. It will be a good beer to have on a hot summer afternoon. I don’t think it’s as refreshing as a Shandy (link) but that’s just me. The final sips were at 68 degrees. It was less refreshing since it was less carbonated but I must say that it still did not pick up any unpleasantness. It was smooth, clean and refreshing to the last warm drop. Well, I rate by style and I have to call it like I see it, so this is a solid B+ for me. I need to drink and review more of these lighter summer beers in order to have more accurate ratings by style but as it stands now I’m sticking to a B+. Surprising as that is; this is a very good refreshing beer. I highly recommend this beer to anyone looking for an easy drinking summer beer. But be careful it may be the first step to unleashing the “Beer Snob” in you. Final Thoughts:So on a more personal note; I must thank the Wilson Family for giving me this beer. To be quite honest I would not have bought this beer on my own. I guess that’s a sad reality to being a beer snob. The road to more excellent craft beers is paved with little gems like this one. So we, no I, need to slow down and enjoy these little treasures that are easily overlooked. The more we consume these beers the more large brewers like Coors and others will realize that there is a thirsty market out here for good, drinkable and affordable beer.